A football club chairman has spoken of his "disappointment" after three of his players were jailed following a brawl. Bristol City's chairman Steve Lansdown described the sentences of David Partridge, 27, Bradley Orr, 23, and Steve Brooker, 25, as "harsh". Orr and Brooker were sentenced at Bristol Crown Court to 28 days. Partridge was sent down for two months. 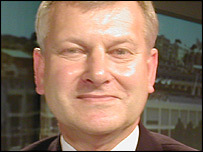 Mr Lansdown said: "We feel the sentences are harsh, bearing in mind it would seem the players were provoked." He went on: "The players were disciplined by the club last October and one of the disappointing features of this case is that it has taken so long to be resolved. "Management have taken steps since this date to ensure that incidents like this will not occur again. "The players have decided not to appeal against the sentences, which is their decision alone, with the aim of putting this unsavoury episode behind them and getting on with their careers. "The board will review each player's situation after taking legal advice to decide what action, if any, should be taken against them." The group were on an evening out when violence erupted as Partridge was ejected from the Romeo Browns nightspot in Bristol city centre. He became involved in a fight with bouncers and his team mates then became involved. Orr was sent off recently for headbutting a team mate in City's 3-1 win at Northampton.